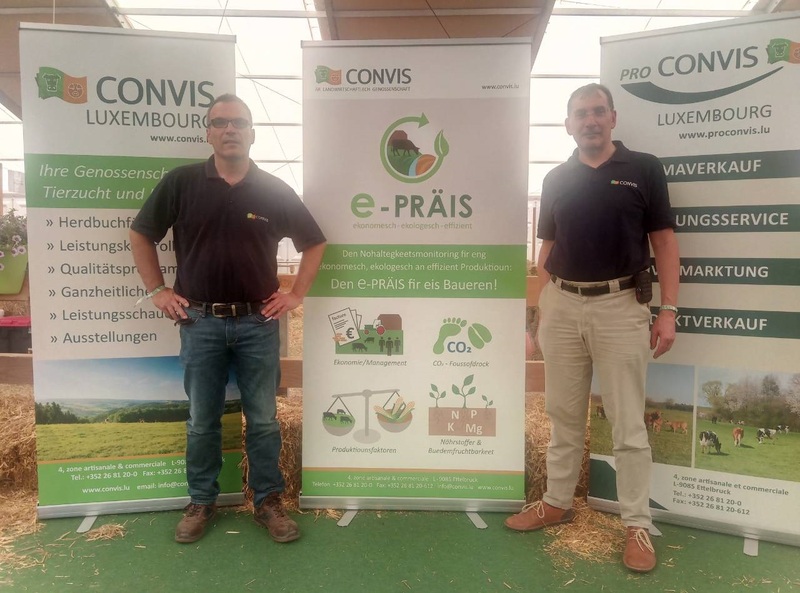 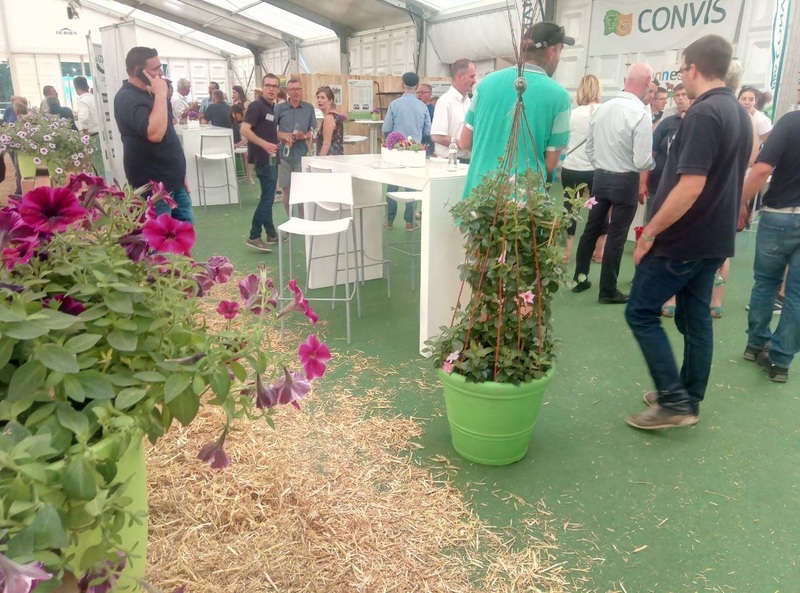 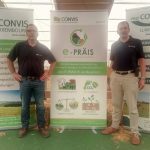 Our Luxembourg partner Convis was at the Agricultural fair of Ettelbruck held from 29/6/2018 to 1/7/2018. 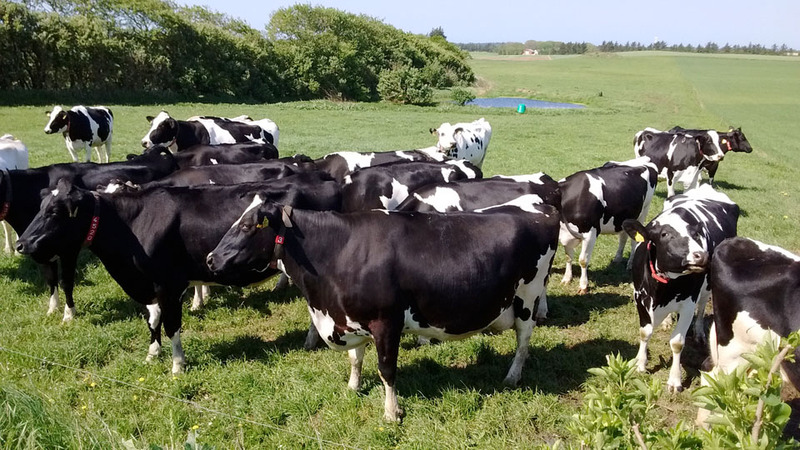 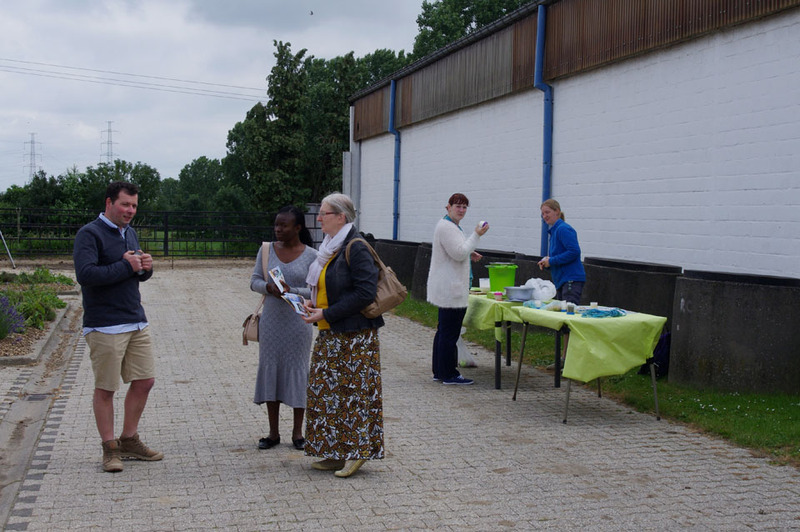 They provided information to visitors about the outcomes of the project and about the opportunities to decrease the carbon footprint of dairy products. 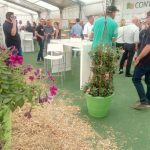 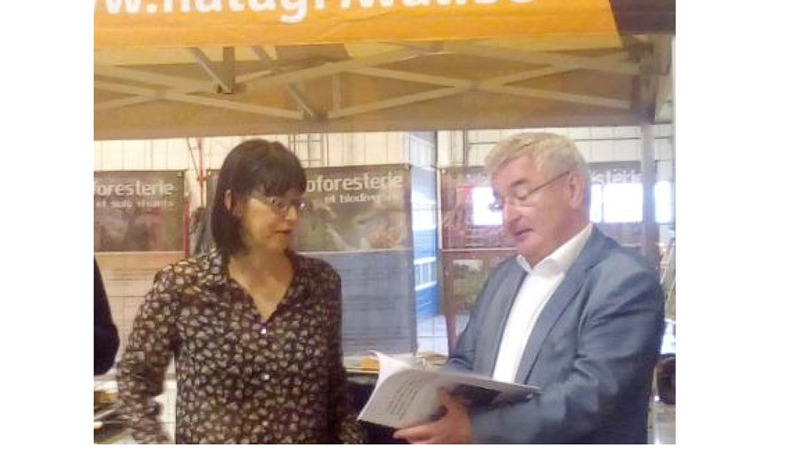 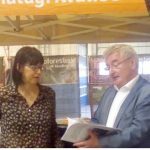 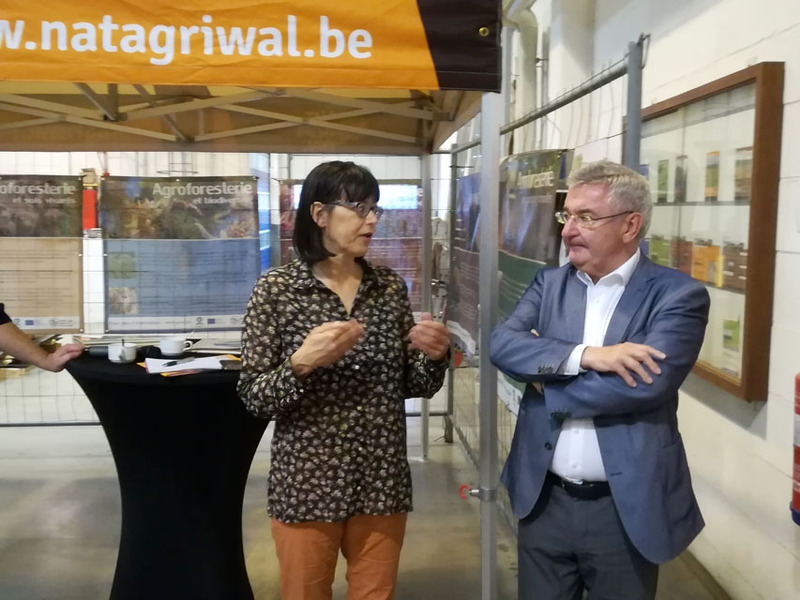 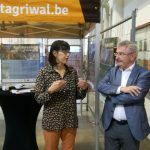 The Centre of Agronomic Technologies participated in the Open farms’ days organised on 23-24 June 2018. 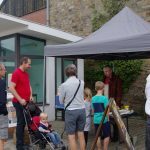 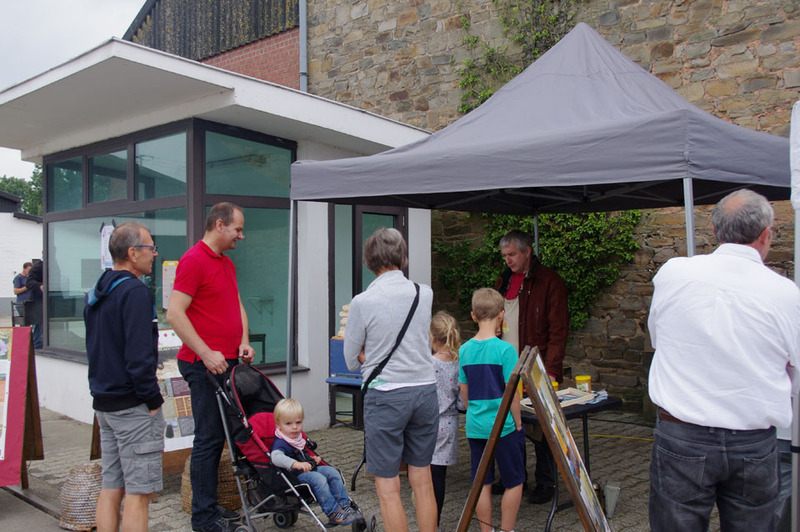 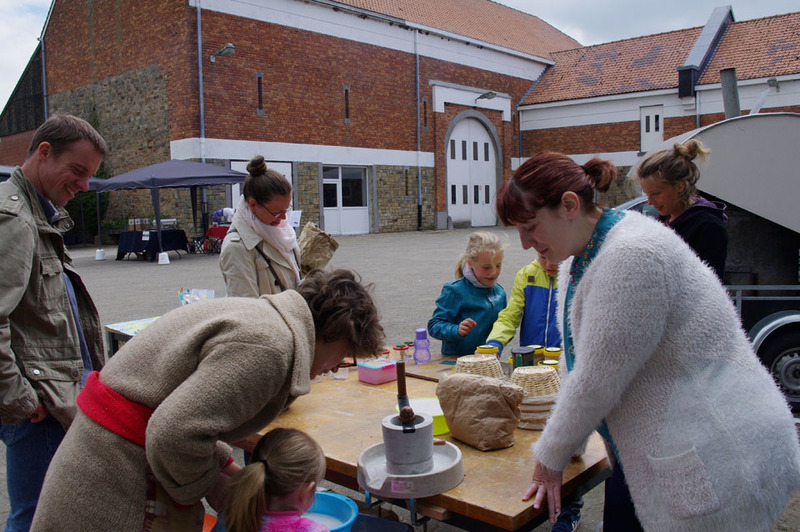 More than 1000 visitors came to the Centre and took part in the numerous workshops. 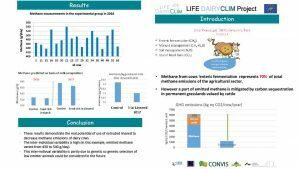 The opportunity to present the project Life Dairyclim and to discuss its outcomes. 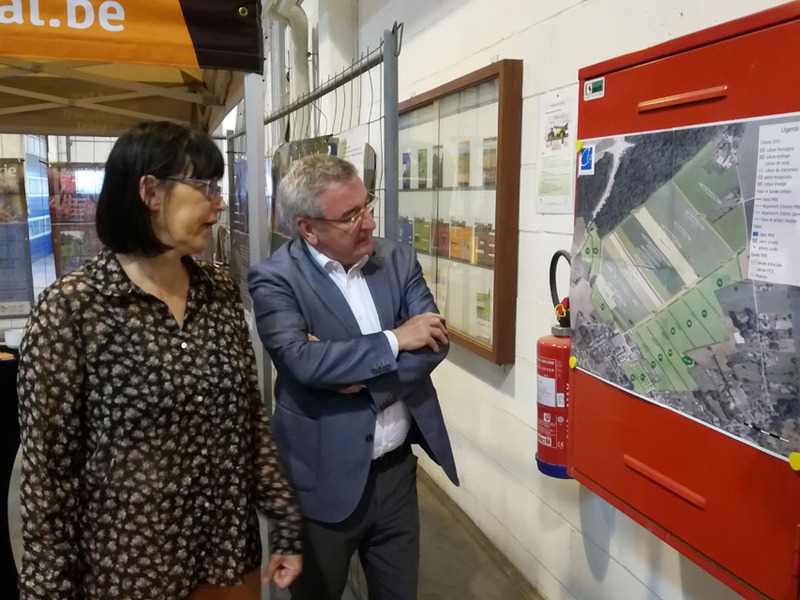 The CTA (the Center of Agronomic Technologies) got the honor to welcome the walloon Minister of Agriculture René Collin this 1st of June 2018. 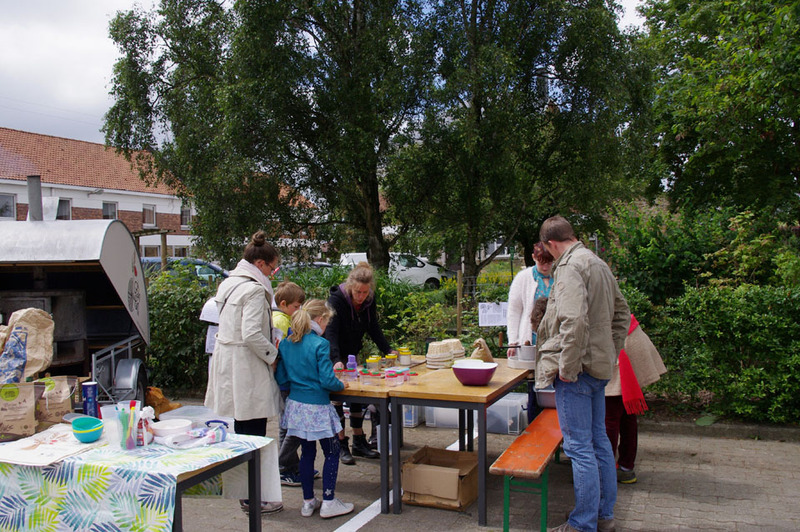 The opportunity to present the various activities, projects and the different associations present at the Center. 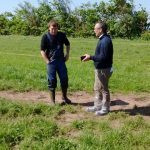 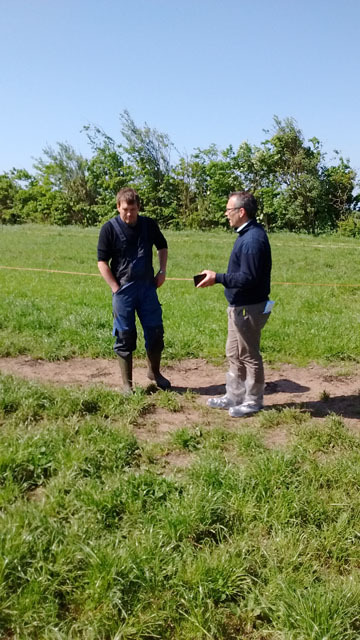 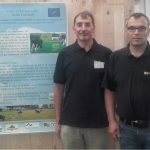 The opportunity, also, for the project Life Dairyclim to give him the report on the evolution of grasslands in Wallonia, in Luxembourg and in Denmark. 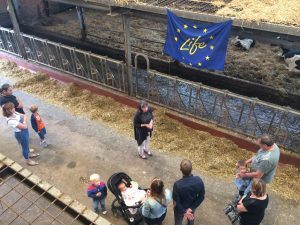 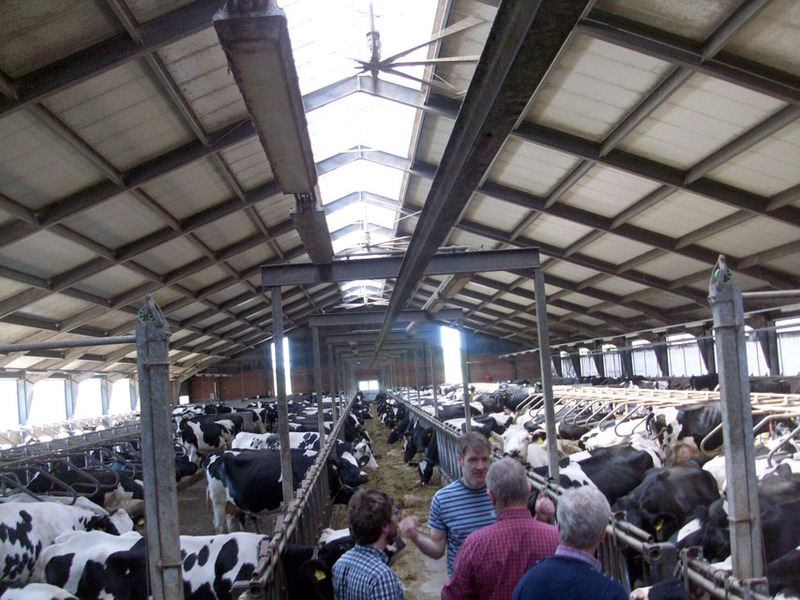 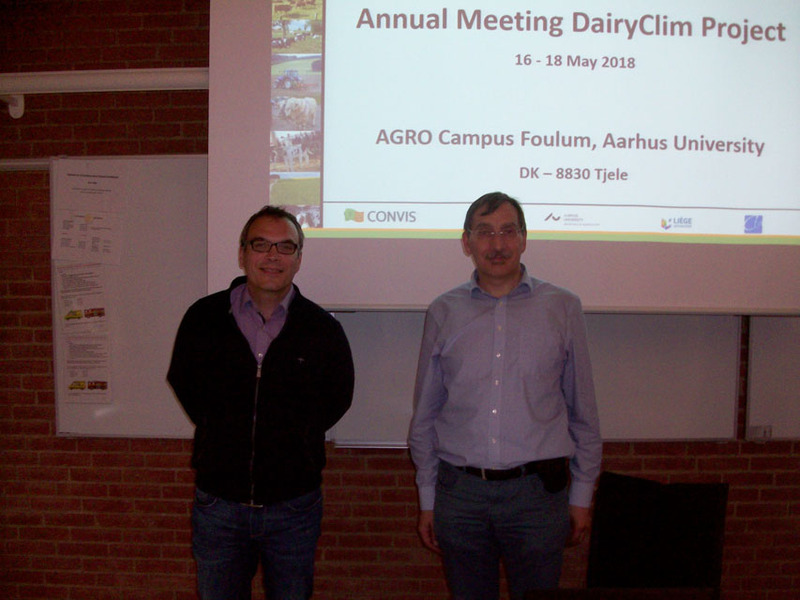 The annual meeting of the Life Dairyclim project was held from 16/5 to 19/5 in Denmark. 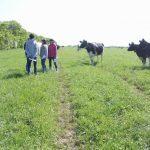 We got the opportunity to visit 2 pilot farms very different; the first one an organic farm with grazing and the second one, conventional. 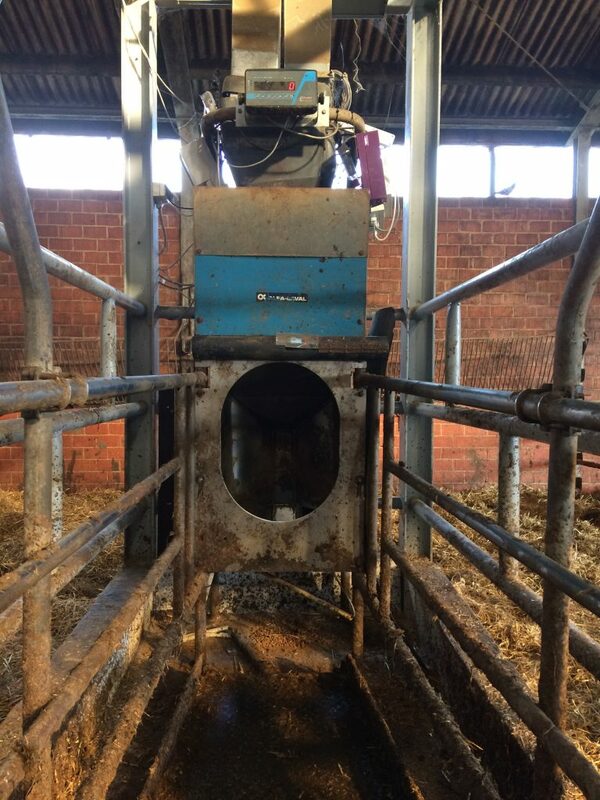 Both are equipped with automatic milking systems. 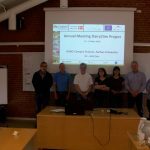 During this stay, the members of the consortium gathered several times. 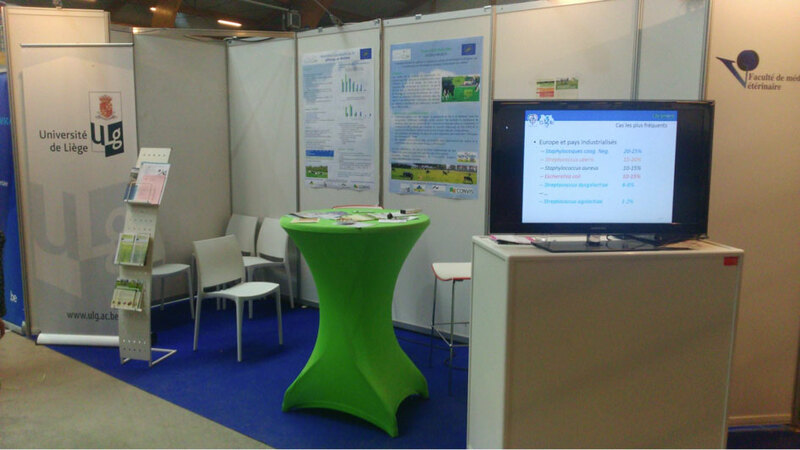 The opportunity to discuss the progresses made and the results achieved. 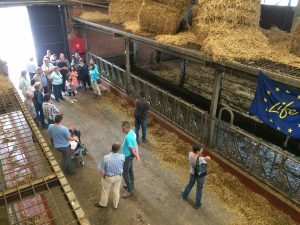 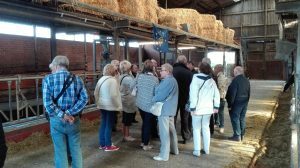 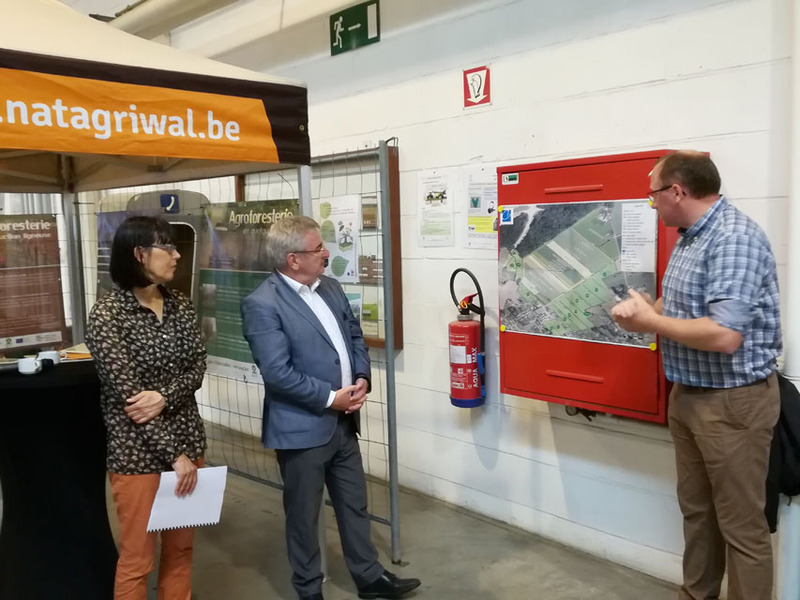 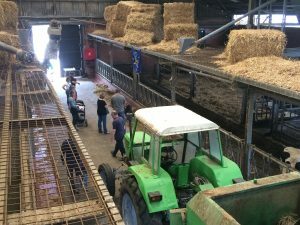 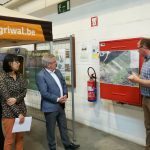 The animation team of the Walloon Rural Development (RWDR)organised the 5th step of the Innovation road at Marc Grandjean’s farm in Bovigny. 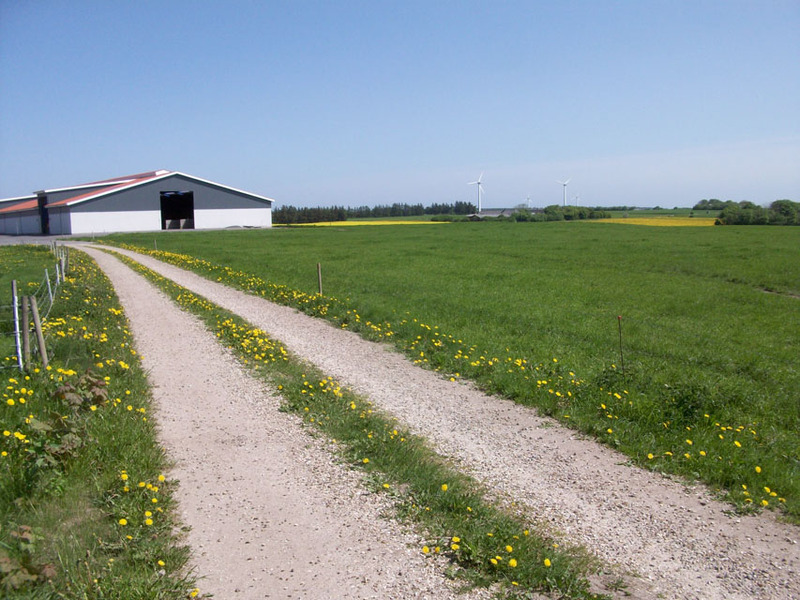 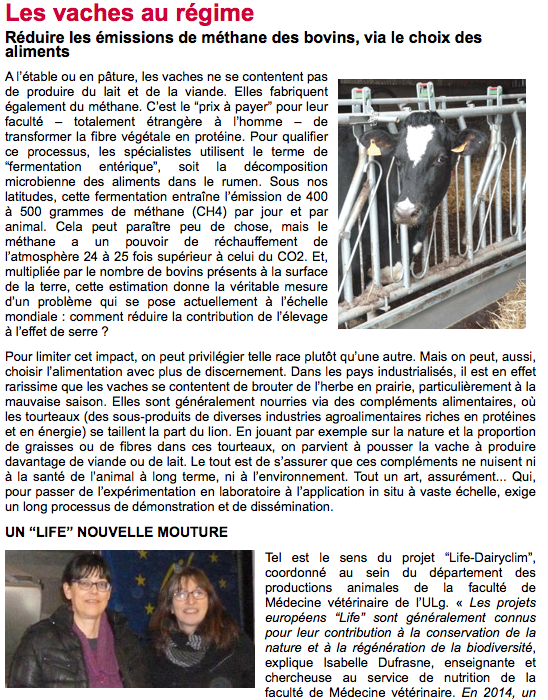 The opportunity to present the Life Dairyclim project and the first outcomes collected in this pilot farm. 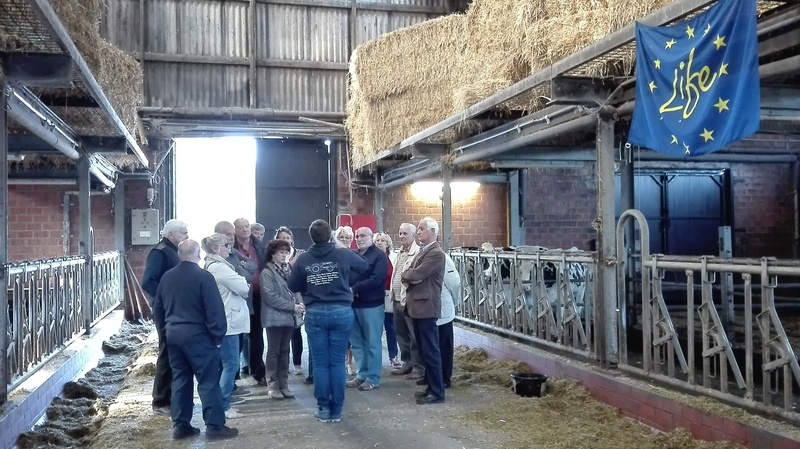 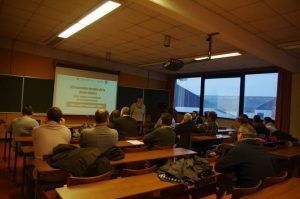 On December 12th, breeders traveled to Strée Agronomic Technologies Center for an afternoon dedicated to the sustainable feeding of dairy cows. 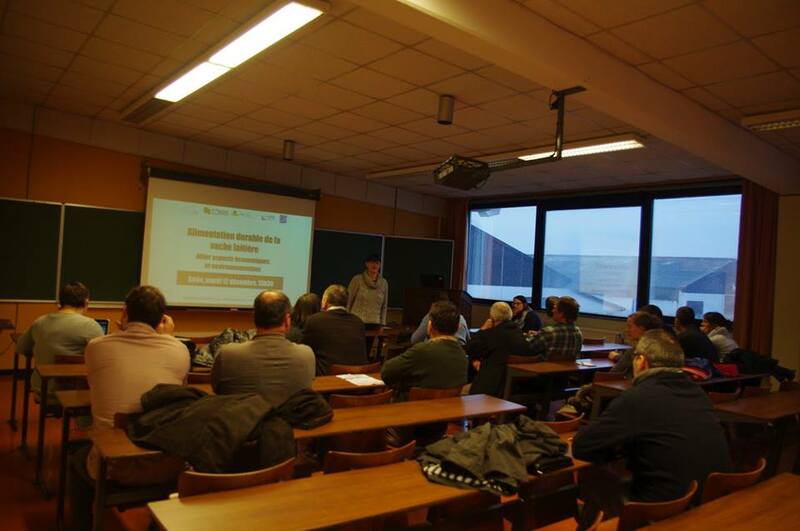 Led by Marie Manguette (SPW-DGARNE-Research and Development), the meeting generated some curiosities. 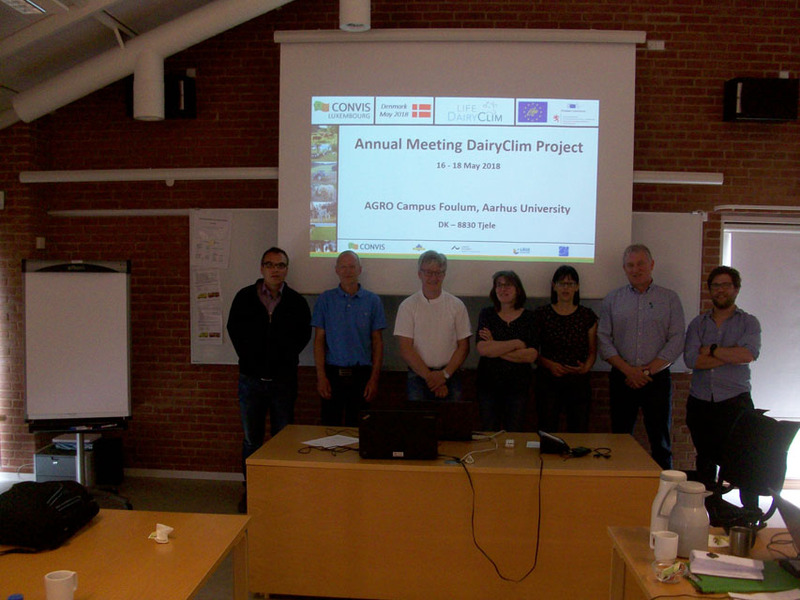 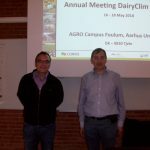 The results of the Dairyclim project were strongly presented. Evaluation of the herd’s food valuation. 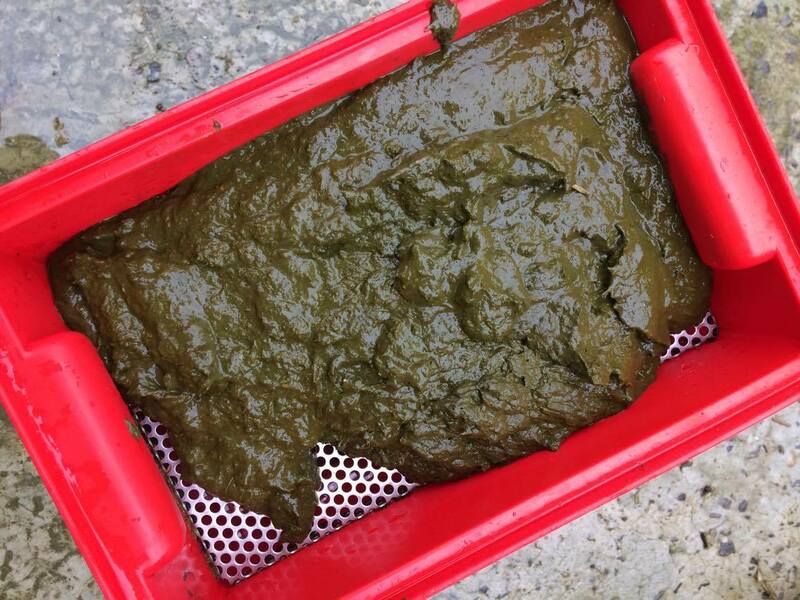 A mixture of faeces of at least 10 animals and weighing at least 1 kg was dug-sown at 2 levels (coarse and fine). 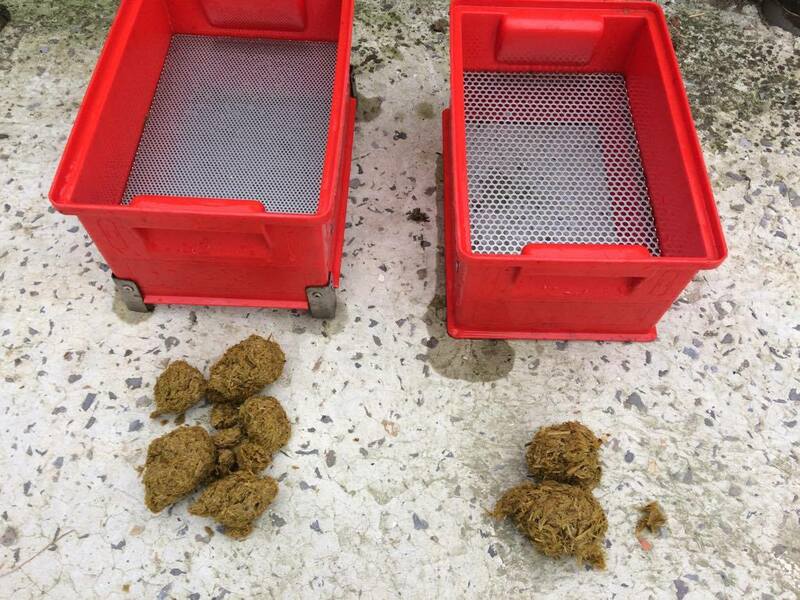 For a good valuation of the ration, the proportion of fibers found in the sieves should not exceed 10% and 20% of the sample in the first and second sieves. 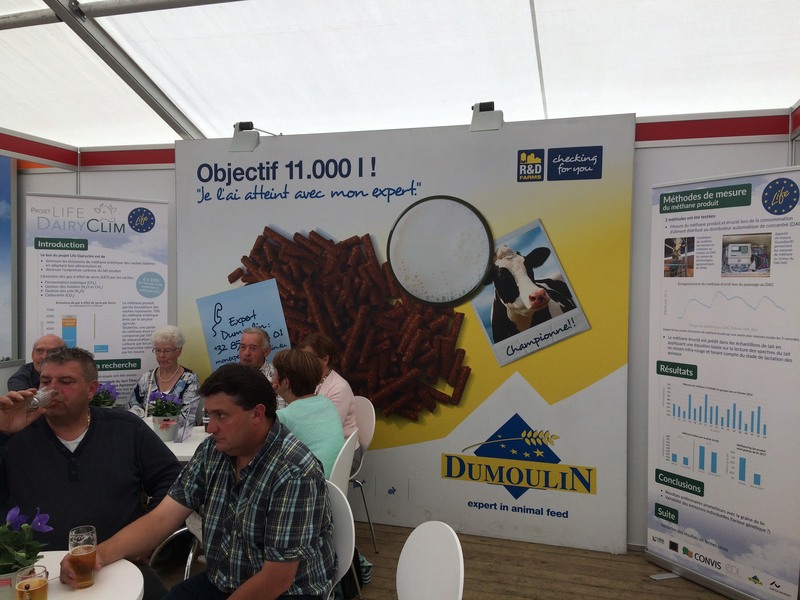 This weekend of September 2nd and 3rd, 2017, our partner Dumoulin was present at the Battice Agricultural Fair. 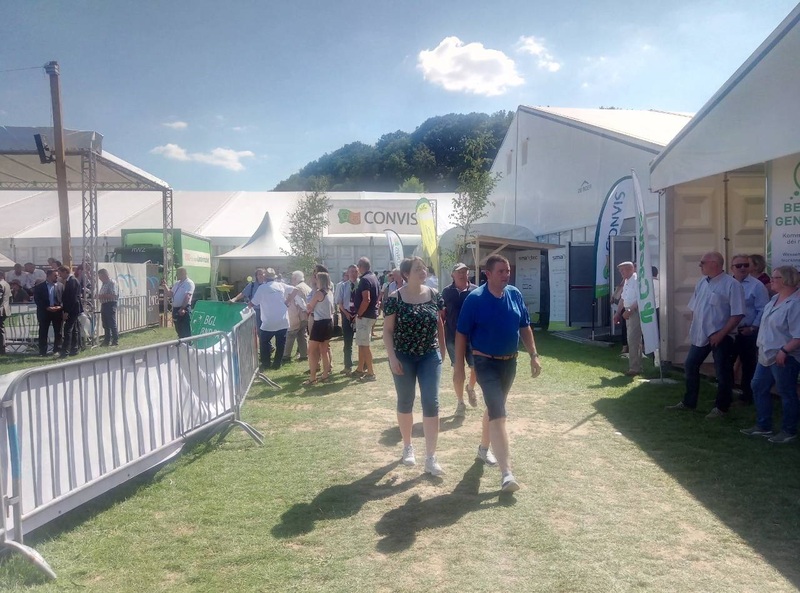 The fair welcomed 22,500 visitors. 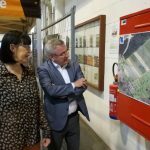 Small inventory of places in pilot farm. We were present on the fair of Libramont from the 28th to the 31st of July. 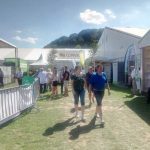 This 83rd edition of the fair brought together some 212 173 visitors. 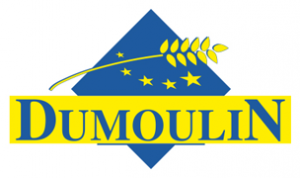 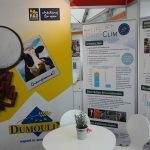 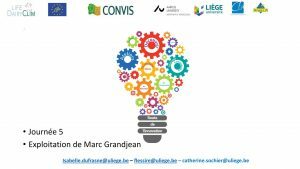 The project was presented on the booth of our partner Dumoulin and on the stand of the University of Liège. 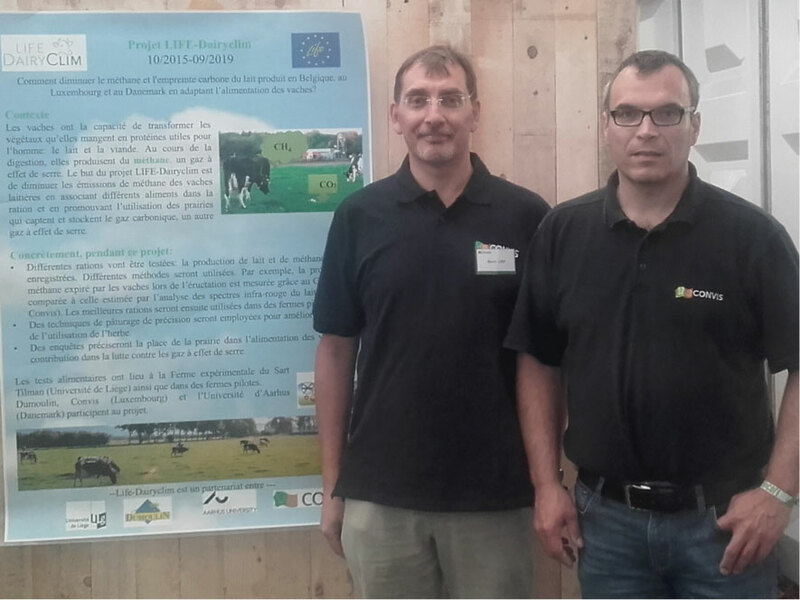 A poster presented methods for measuring the methane emitted by the cows and the first results of the project. 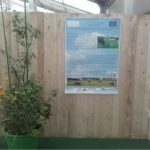 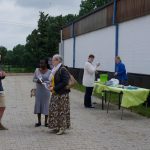 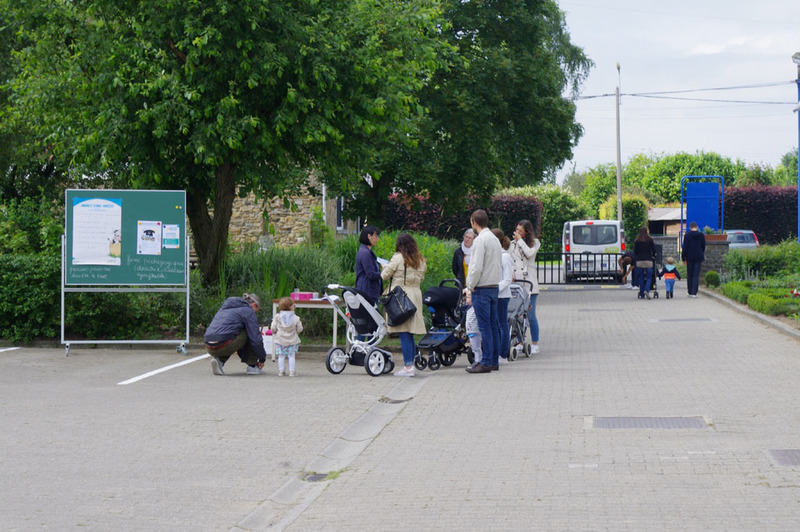 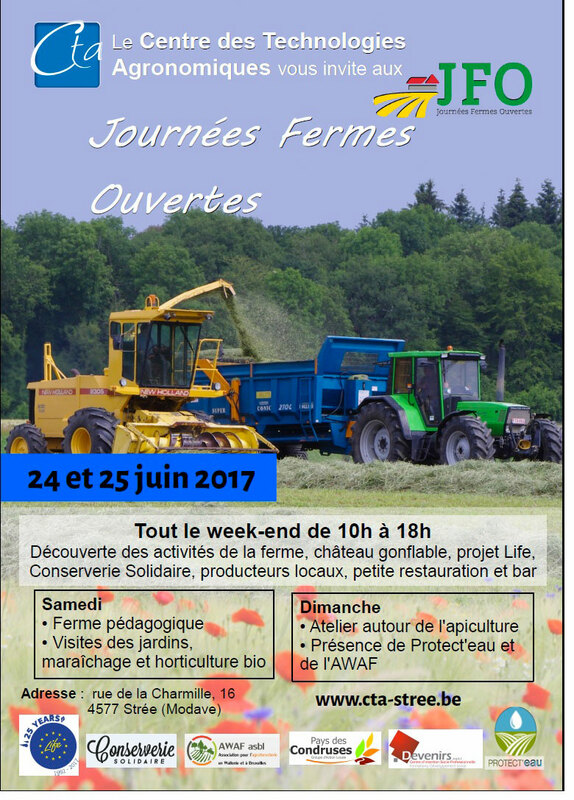 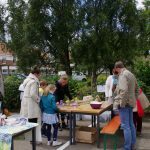 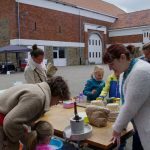 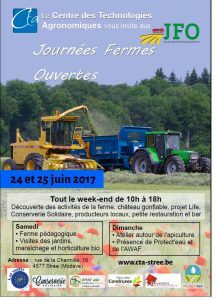 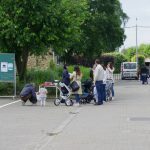 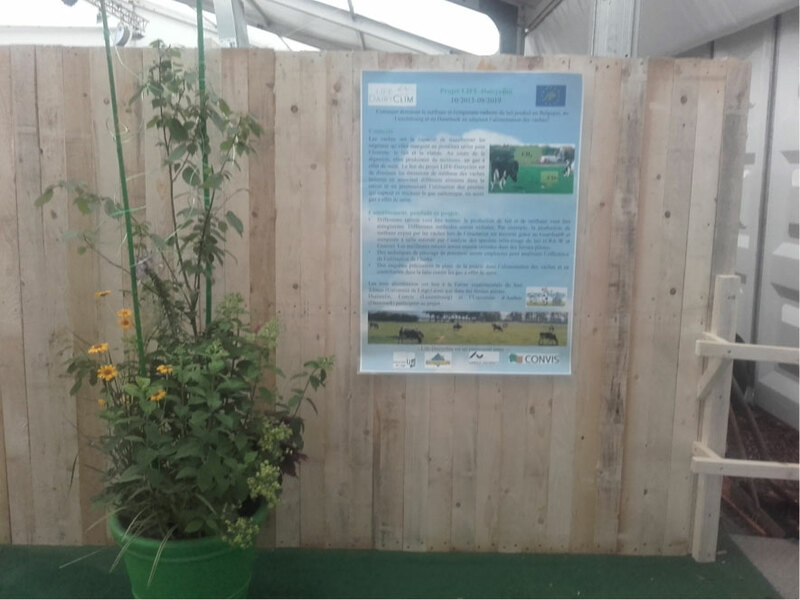 The project was presented as part of the Open Farms Day organized at CTA Strée on 24 and 25 June. 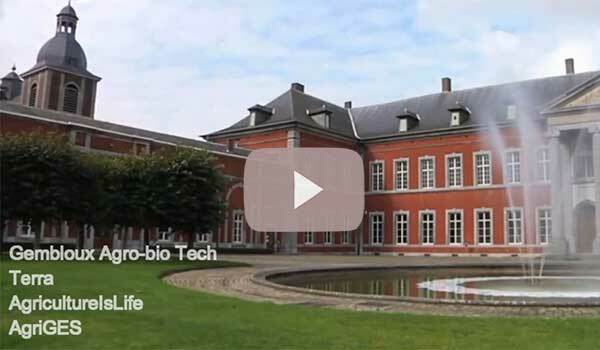 We had the opportunity to answer an interview for the town of Tinlot Blog, here is the video.. 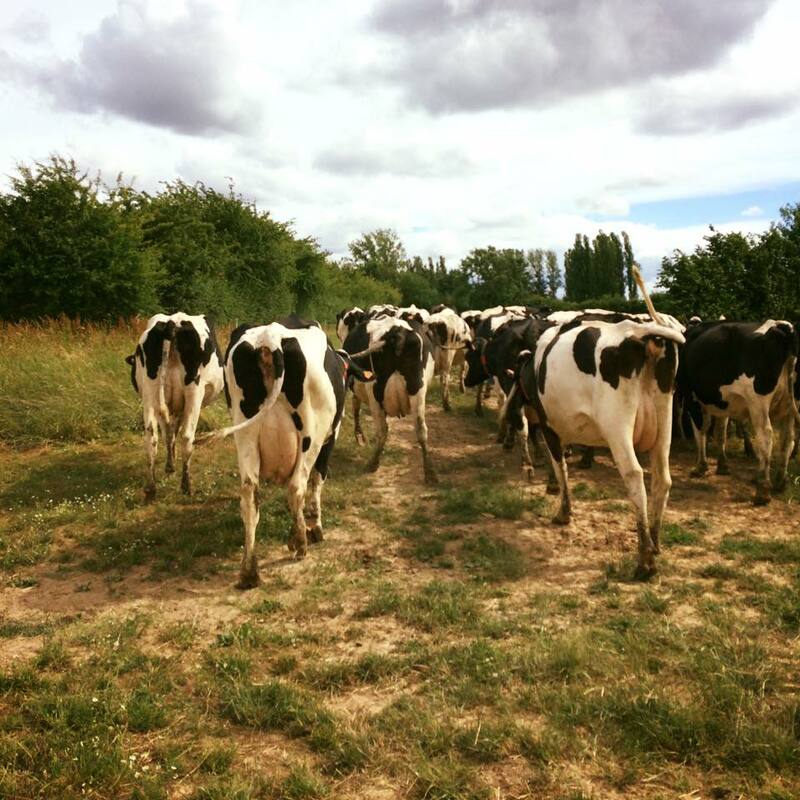 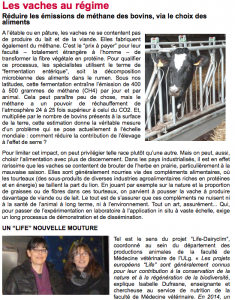 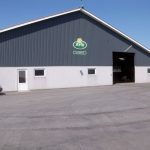 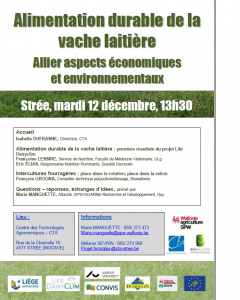 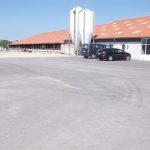 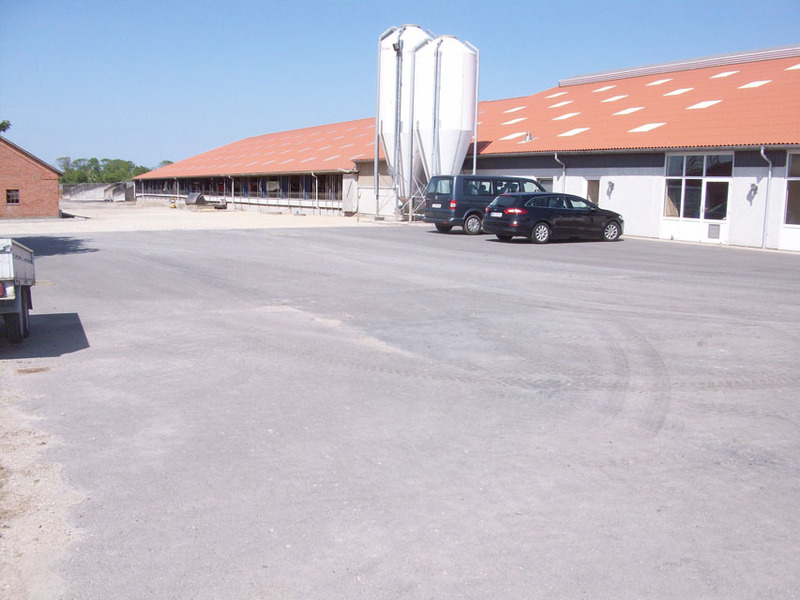 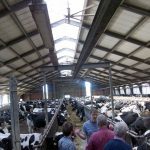 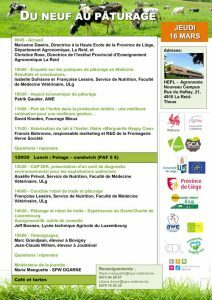 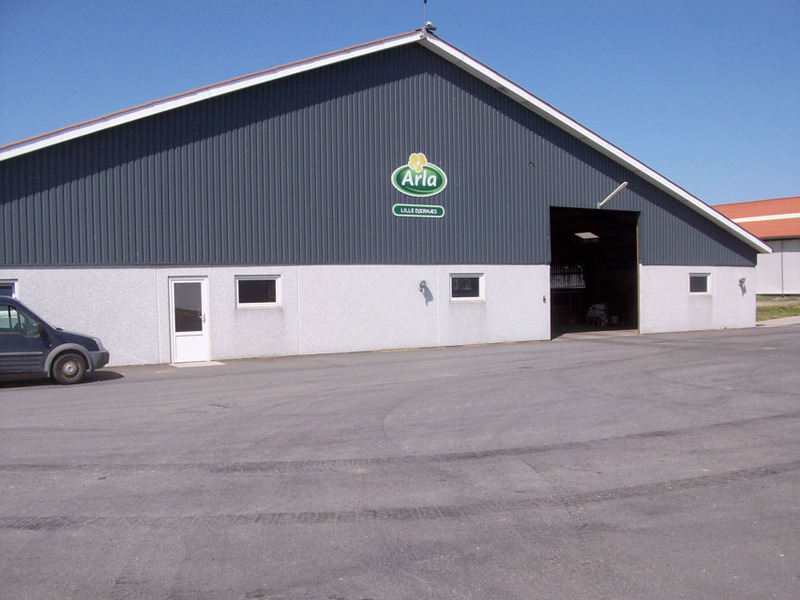 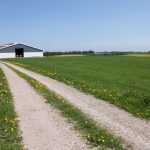 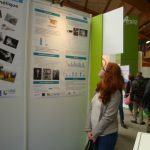 The Life-Dairyclim project will be presented as part of the Open Farm Days at the Agronomic Technologies Center in Strée. 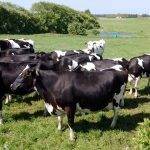 It’s time to milk the girls! 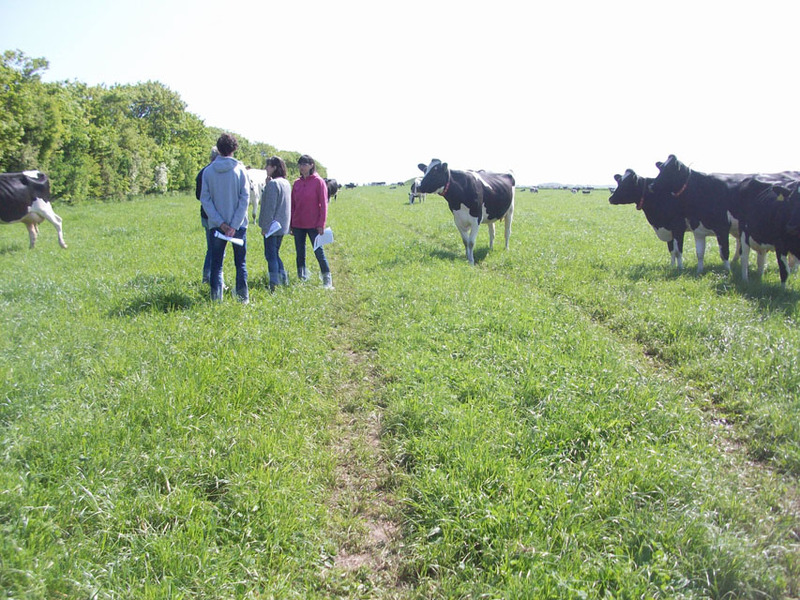 En route to collecting milk samples to evaluate methane. 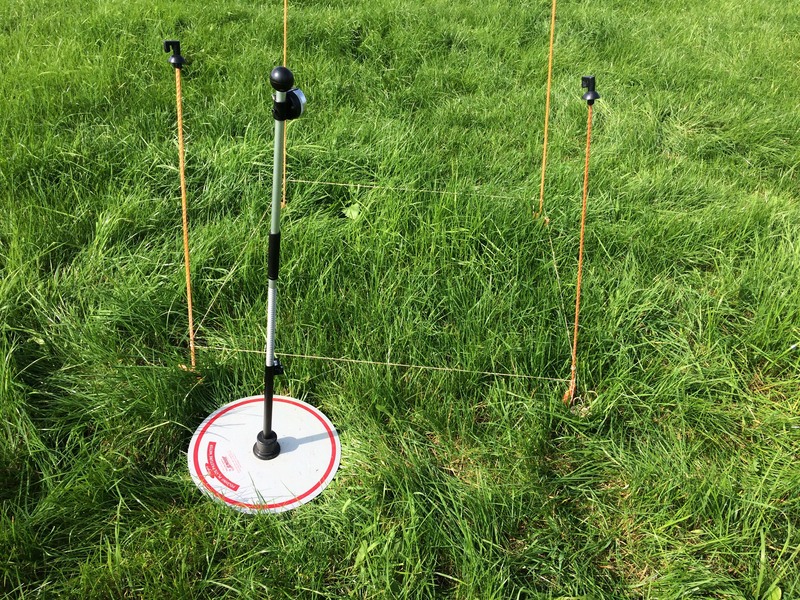 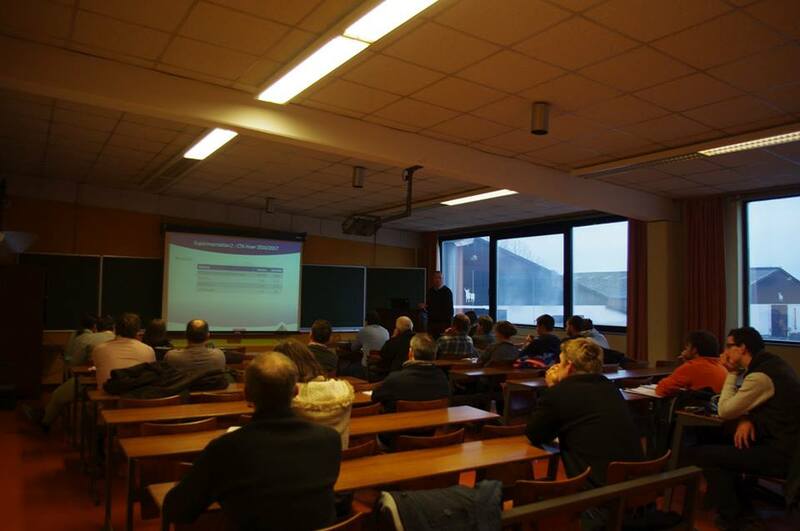 The results of the survey on grazing practices in Wallonia will be presented on 16 March as part of the “Nine to Grazing” day organized at the HEPL-agronomy section of La Reid. PowerPoint available here or in the Literature tab. A new test season will begin. 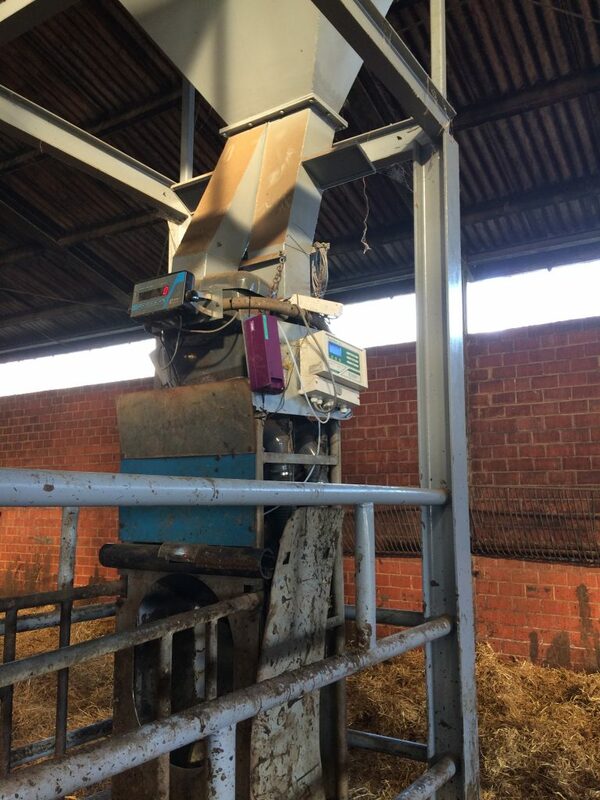 We have adapted our gas measuring system to the Automatic Concentrate Dispenser (DAC) in connection with weighing. 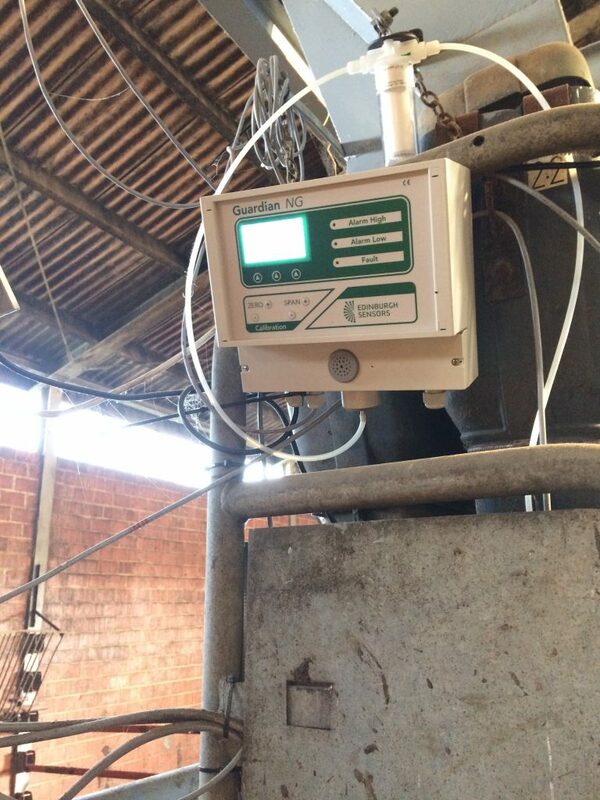 As soon as a cow arrives at the DAC, the system records CO2 and CH4 emitted as well as the weight and identification of the cow. 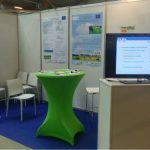 We were present at the “Innovation Fair” of the “Terra” platform at Agrobiotech in Gembloux on 20/5/2016. 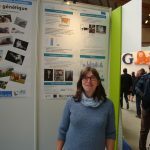 A poster was also published on this occasion. Faut-il mettre les vaches au régime pour limiter les gaz à effet de serre ?